Creating the right impression is important for your business, and our polyester/cotton work shirts are not only smart, they are easy to launder and will keep looking good, wash after wash.
We supply work shirts for both male and female workers, so if you need front of house or receptionist shirts, our traditionally styled Oxford shirts will fit the bill. The long sleeve Oxford shirt for men has a regular fit and can be ordered in a range of sizes from 14.5 inch to 20 inch collar. The shirt has a button down collar and comes in 220gsm cotton/polyester. The popular Oxford weave is a type of basket weave where the threads are threaded through each other. This means that there are interlinking weft and warp threads resulting in a comfortable and robust fabric. The long sleeved Oxford shirt is available in white or light blue easy care fabric, 70% cotton and 30% polyester that is suitable for a domestic wash.
Our short sleeve Oxford shirt is also available in 220gsm fabric in light blue or white. 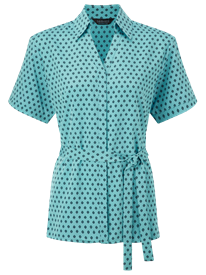 It also features a button down collar and comes in sizes 14.5 inch to 20 inch. Like our other shirts, the short sleeve shirt can be embroidered with your company’s logo to create a more personalised impression. 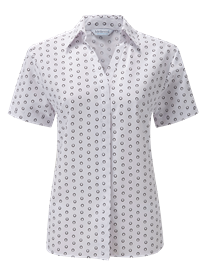 The ladies’ long sleeve Oxford shirt is also available in white or light blue in a light 130gsm fabric. The white shirt is manufactured from 70% cotton and 30% polyester, while the light blue shirt has 77% cotton in the easy care fabric. 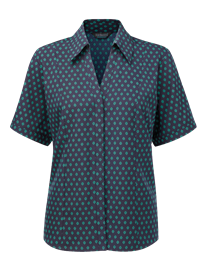 This shirt also features one breast pocket and is available in sizes from UK 06 to UK 20. 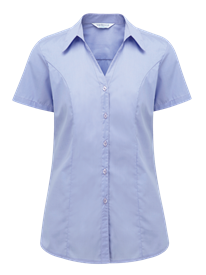 Always popular for receptionist shirts, our ladies’ short sleeve Oxford shirt is also manufactured from an easy care cotton/polyester mix. The white short sleeve shirt has 70% cotton and 30% polyester in the fabric and the light blue version has 77% cotton in the 220gsm material. Styled with one breast pocket, this shirt can be ordered in sizes from UK 08 to UK 24. Like our other work shirts, it just needs a domestic wash to keep it looking good.